While in Colorado on Sunday…. I remember climbing into the alpine slide with Lauren sitting beside me, about to race me down the hill. I remember being the only person wearing a skirt that day, with my husband’s jacket wrapped around my legs so I wouldn’t inadvertently flash anyone while going down the slide. I remember, right after take off, Lauren screaming that there’s a chipmunk on her slide, twice. I remember the tall wildflowers leaning onto the track creating a wall of greenery surrounding us. I remember getting off the slide as it started to gently sprinkle. Then I remember finding out the gondolas were closed due to the impending storm and lightning. I remember hearing we only had to wait 3 minutes for the bus to come. I remember hearing the thunder right above us. I remember seeing the lightning reflecting off my friends’ faces. And I remember Kellen saving my camera in his backpack as the rain started to pour. I remember hiding my face against Andy’s chest as the storm poured down around us, as Debbie ran out into the rain, arms open wide, yelling how wonderful it all was. I remember that bus being more than 3 minutes. I remember the driver not being able to see out the front windows, just pure white from the fog. 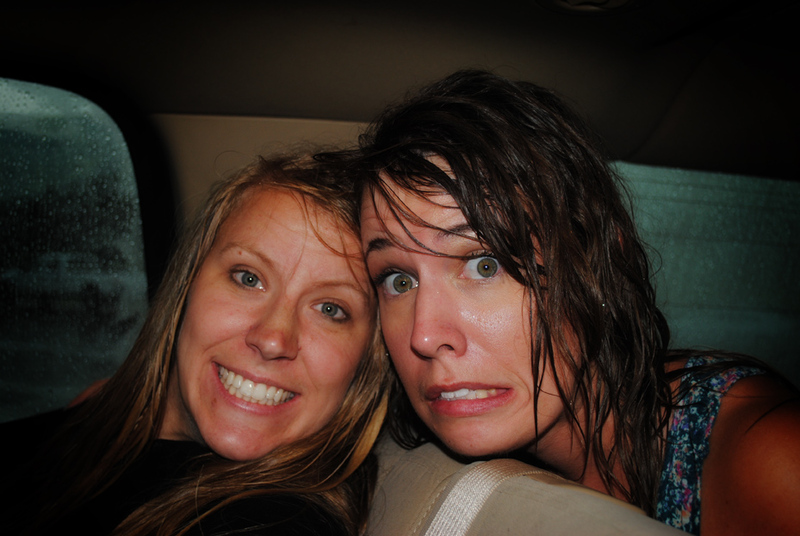 And I remember taking my flip flops off to run to the car, feeling the soaked asphalt and rain slapping down around me. Very nice Sam and very creatiive.